It is difficult to believe that this pin is over 50 years old. I say that not because of condition although it is in wonderful shape. I say this because the style is just as wearable today is it would have been back in the 1950s. 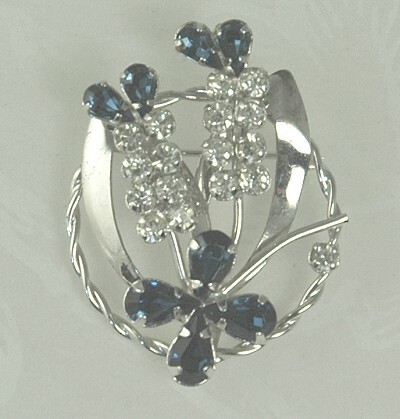 A very feminine sterling silver setting holds a floral of prong set Montana blue and clear rhinestones. There is a loop on the reverse where you can add a chain. This pretty piece then becomes a handsome necklace. The hallmark appears on the reverse. Condition: Excellent vintage. Minor plating wear detected under magnification. Measurements: 1 1/2" long and 1 1/8" wide.